SOUTHINGTON - After the first week of the season, the Berlin baseball team was riding high, sprinting out to a 4-0 that included a win over the defending Class L state champs in Wethersfield. Others began to take notice. Even a recent high school poll tabbed the Redcoats as a top-10 team in the state after its 4-3 win over Platt on Saturday. One loss certainly doesn’t cause a now 4-1 team to crash back down to earth, but Tuesday’s 8-1 loss to Southington was a not-so-subtle reminder that there is still work to be done, regardless of how many wins have been tallied in the young season. 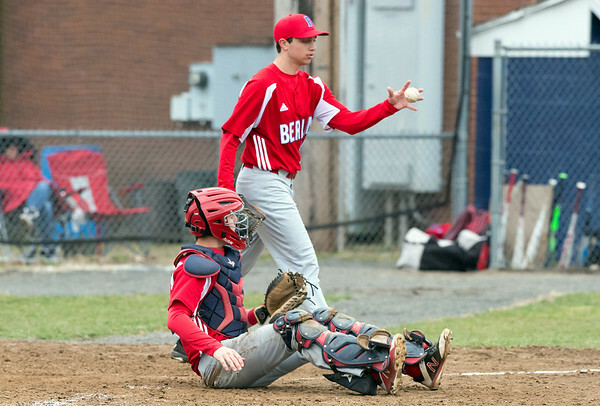 Berlin’s bats were quiet on Tuesday, recording just three hits in the losing effort, but as he has for the past three decades as the Redcoats’ head coach, Leo Veleas preached pitching and defense after the game. The offense was dormant, but if Berlin is to put together another win streak, run prevention will have to be better. Veleas believes as long as that is kept in check, the offense will come around. The Redcoats were frustrated after losing to the Blue Knights for the third year in a row, but they see the loss as a reminder of what is needed to maintain the strong record they started the season with. An experienced group led by seven returning seniors has kept the defense a strength. If there’s a group that can take a first loss for what it is and move forward, it’s a senior-heavy group like Berlin. The Redcoats expect a lot from themselves, and while they wanted a 5-0 start that included a win over a nearby rival, they will take the defeat as a lesson that will ultimately make them better as the season progresses. There’s always been debate in the sports world if there is such thing as a “good loss,” and for now, Berlin is putting the defeat to Southington in that category. The Redcoats’ undefeated season was taken away, but they gained perspective in return. Berlin’s chance to bounce back will come after a six-day break before jumping right back into another opportunity of another winning streak starting on Monday. Posted in New Britain Herald, Berlin on Wednesday, 10 April 2019 21:20. Updated: Wednesday, 10 April 2019 21:23.